Blue and Orange Geometric Sea Shell Sgraffito. Modern, Minimalist, Unique and Funky Sterling Silver Necklace and Earring Set. 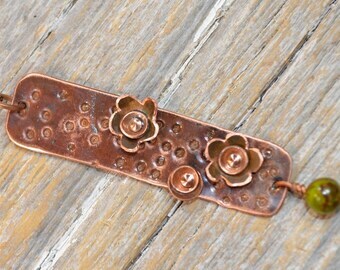 Announcement Reagan Juel was born because I've always loved jewelry. Playing with my grandmothers costume pieces was my favorite thing in the world to do as a kid. And that is how Reagan Juel started. 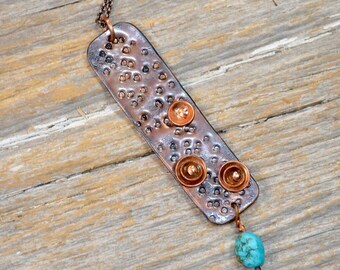 Saving broken vintage jewelry and making it into something new. But as I've gotten better and acquired more skills I realized being a smith was my heart so I just do metal now. 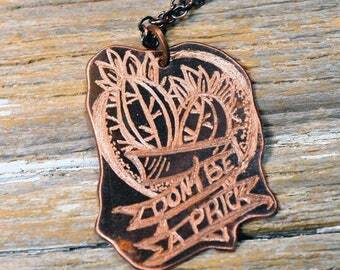 Engraving is a process where I have a tool called a flex shaft and I sit down and draw on the metal. Think of it as giving metal a tattoo. So yes all of this stuff is hand drawn. Nothing is mass produced. Everything comes from my heart and the skills I've learned in the 9 years I've been doing this. Please enjoy looking around. I think I have some really cool, very unique, and very creative pieces. 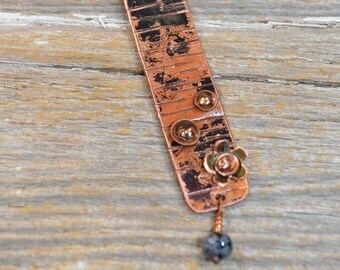 I happily switch out clasps, earring backs and lengthen or shorten chain. Just ask. I also usually ship the next day after payment. Custom orders please allow 2-4 weeks. 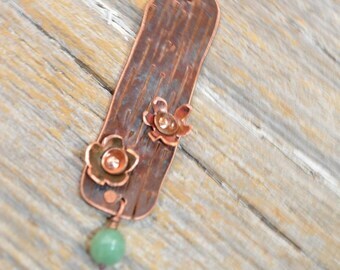 Reagan Juel was born because I've always loved jewelry. Playing with my grandmothers costume pieces was my favorite thing in the world to do as a kid. And that is how Reagan Juel started. 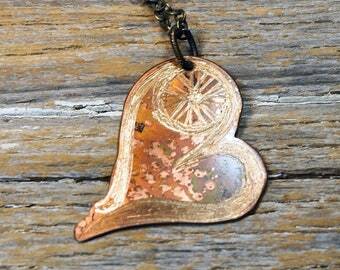 Saving broken vintage jewelry and making it into something new. But as I've gotten better and acquired more skills I realized being a smith was my heart so I just do metal now. 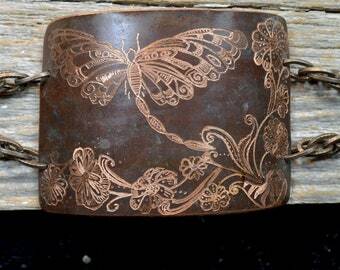 Engraving is a process where I have a tool called a flex shaft and I sit down and draw on the metal. Think of it as giving metal a tattoo. So yes all of this stuff is hand drawn. Nothing is mass produced. Everything comes from my heart and the skills I've learned in the 9 years I've been doing this. Please enjoy looking around. I think I have some really cool, very unique, and very creative pieces. 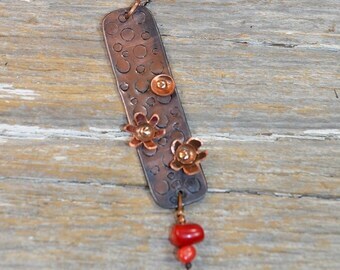 Long Rectangular, Reclaimed Copper, Textured Pendant with Two New Old Stock Flowers made into a Folk Art Artisan Crafted Necklace. 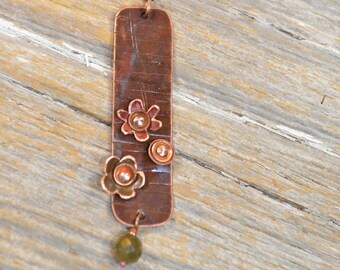 Long Rectangular, Patinaed Copper, Textured Pendant with Two Flower Folk Art Artisan Crafted Necklace. 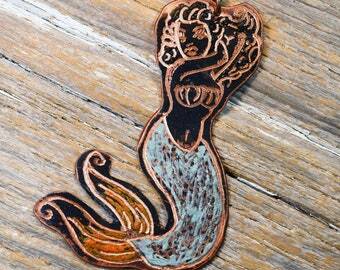 Hand Textured, Sawn, Cut, & Formed. 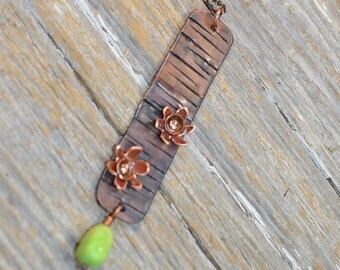 Long Rectangular, Reclaimed Copper, Textured Pendant Flower and Disc Folk Art Artisan Crafted Necklace. Hand Textured, Sawn, Cut, & Formed. 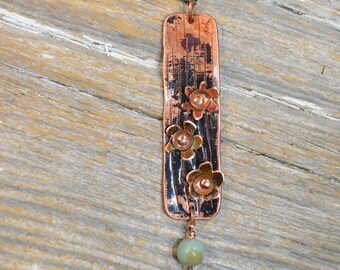 Long Rectangular, Reclaimed Copper, Textured Pendant with Two Flower Folk Art Artisan Crafted Necklace. Hand Textured, Sawn, Cut, & Formed. 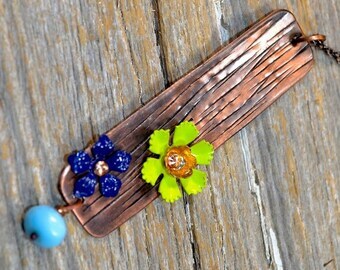 Long Rectangular, Fired Copper, Textured Pendant with Three Flower Folk Art Artisan Crafted Necklace. Hand Textured, Sawn, Cut, & Formed. 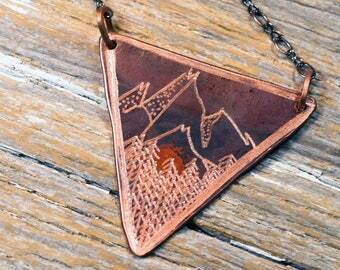 Mountain Necklace, Wanderlust; Handcrafted from Patina Copper. The Mountains Are Calling. 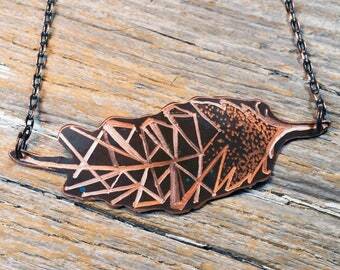 Hand Cut, Hand Engraved, Crafted, Finished. 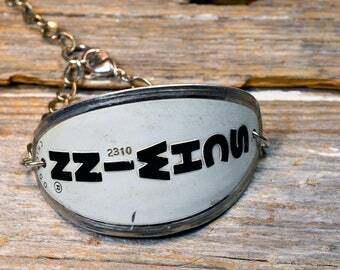 Vintage Record Player Necklace - Love vinyl? 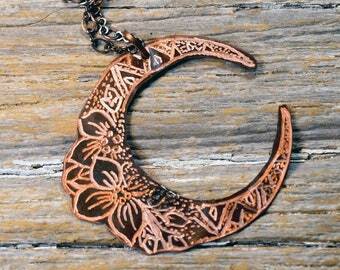 Hand engraved tattoo inspired record player necklace. I bought a few of these bracelets here, and I couldn't wait to get a couple more. 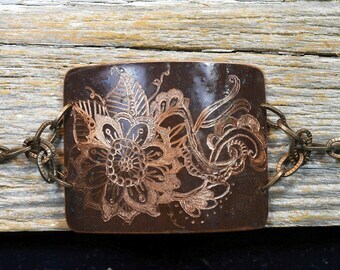 The engraving is beautiful, the style is comfortable to wear, and the customer service is among the best. Thank you, Reagan, for adding so much beauty to the world! A wonderful feature of these bracelets is that they can be worn in either direction, which essentially gives me two wearable artworks in one. To top things off, Reagan is an absolute delight, and provides exceptional customer service. Thank you! 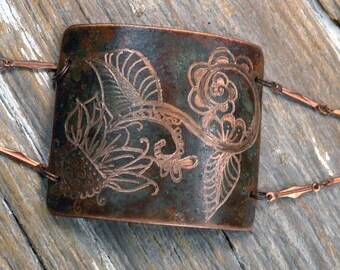 Even though this is the widest cuff that I have ever owned, it feels quite natural on my wrist. I am so happy to have found Reagan Juel! 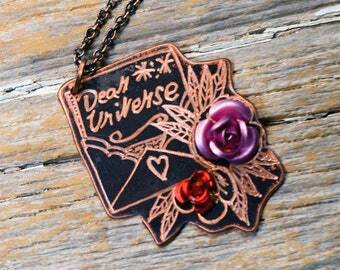 I love my necklace and delivery time was very quick! Metal Smithie Me. 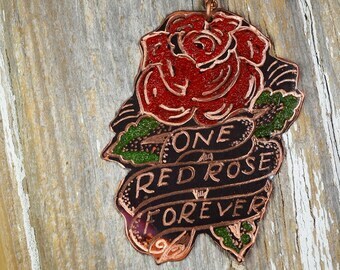 Working on Engravings. To say I've evolved is well kind of an understatement. I seriously started out making glass bead stretchy bracelets we got in a kit from SAMS club. 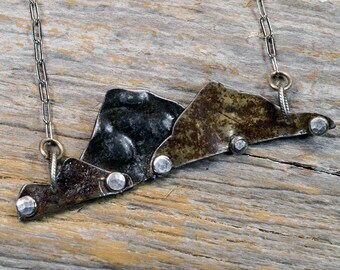 That moved onto upcycled broken vintage jewelry, because well I adore vintage jewelry, and hated that it got thrown out. Which got me going to art shows and listing on Etsy. 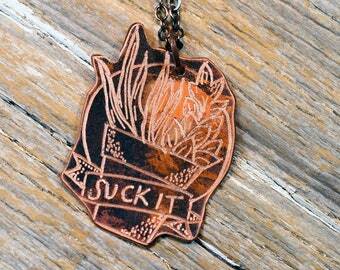 But I wanted to be the best at it so I took a year of metalsmithing to get better at finishing. And left it a smith at heart. So the metals were just a corner of my booth, then they were a 1/3, then a half. 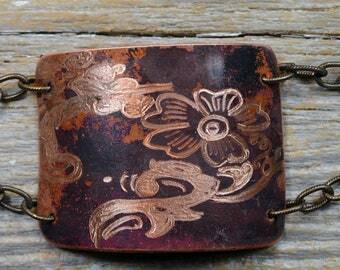 Then I split the whole thing down the middle to see what one sold better and hands down it was the metals. It's not that I wasn't good at the vintage, but so many other people were doing it by now, and I knew in my heart that I needed to focus on the skills I had and they did not. So the smithed stuff, it's a much different animal than the vintage. That one usually is just ideas that pop into my head and become an obsession. Like the Neon line. That idea was born from a piece of clip art that a friend used on her website to advertise her junk show event. It was a photo of an old neon sign that was set in a metal box, hung from chains, and said 'jackpot'. 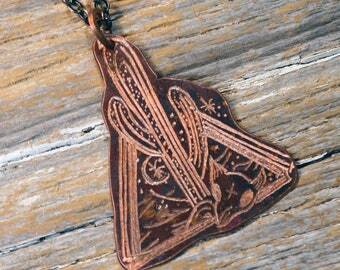 I saw that, saved it off on my computer, and thought, 'how cool would it be if you could take that concept and make it into jewelry? And so I did, and it was really hard to figure out how to do, but that is why it was fun. And so I keep doing. Push harder, learn more, do new things. So that in a nutshell what I do and why. 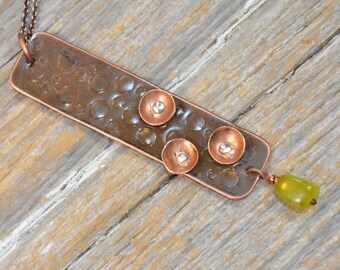 I love to do custom orders too. Nothing to me is more special than when I can take your life and work it into something or create something new. I welcome you. Please take a bit to look around. I say doing this keeps me out of trouble. Truth is I love that I get to this for you! 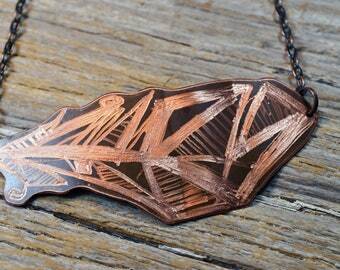 Smithing and engraving are my heart. I am constantly trying to learn harder techniques and bring you new designs. Welcome to Reagan Juel. 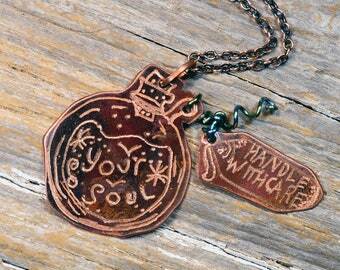 We hope you find a little something that tugs at your soul or brings you a smile. As for other custom orders. We do those too... Provided they fit in with the materials we generally work with. 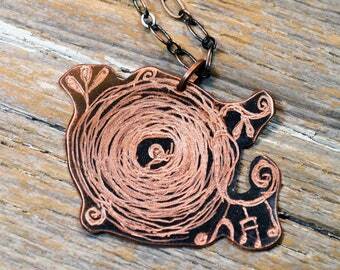 Which are mostly: Copper, bronze and silver; we cut, hammer, dap, engrave, patina, and twist our own , industrial objects; such as real hardware, found broken bits of stuffs old metals such as license plates and ceiling tin. And of course, if you have any questions about any of the payment, shipping, or store policies listed below, please do not hesitate to contact me via email (reagan-juel@q.com). I will accept returns for non-custom pieces (i.e., pieces that I already had made) if you contact me within 7 days of receipt. You will need to return the item (at your expense) to me in the original packaging and in original condition. I can issue either a full refund (minus shipping) or credit for another piece in the shop. 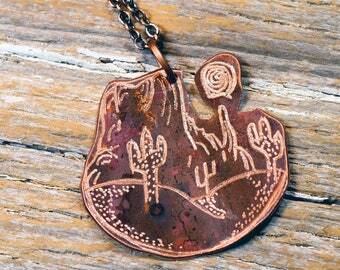 Custom items can be returned for an 80% refund (minus shipping) or 80% credit for another piece in the shop. The item must be returned at your expense in original condition and in original packaging. You must contact me within 7 days of receipt of item. Payment - I accept Paypal (please note that you can still pay with a credit card even if you do not have a Paypal account), money orders, certified or personal checks. I also accept Etsy Direct Checkout. Just keep in mind that with money orders or checks, items will be shipped only after payment is received (or the check clears the bank). If paying by check or money order please get it to me within two weeks from date of sale. Longer and I reserve the right to cancel the transaction. I also reserve the right to cancel a transaction if my items are going to be used for resale. I didn’t think this would happen considering what I do, but it did, so now I have to address it. If you are interested in consigning my work please contact me. But if you just want to buy it and flip it. No thanks. I take too much pride in my designs and care too much about the quality of my work and happiness of my customers to do so. I also do not wholesale at this point in time except on select items. 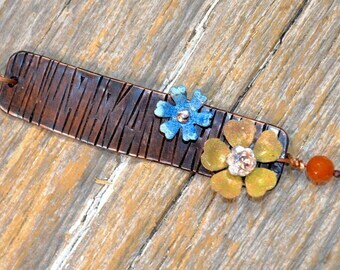 BUT I will offer discounts on certain lines if you would like to make a bulk order. Ask. Shipping - If the item is a custom order, please allow 2-4 weeks for me to make the piece (I can let you know a more accurate timeline via email when you order). Otherwise, I will ship non-custom items to you within two days of receipt of payment. Multiple items may be shipped together. I ship USPS, with delivery confirmation. Need it faster? No problem. Shoot me a message and we will figure it out. Packaging – All items are sent out boxed and in a paded envelope. But if you want an actual wrapped gift box please let me know. First off I am SO sorry I had to raise the rates! It went from approximately 3.00-4.00 to ship a package to the UK to 12.95 to ship that same package. Got to love those 2013 US Postal Service rate changes. I ship you USPS, I get a Customs Declartion number, you can not track off of this. If you would like a different form of shipping convo me and I can shoot you some options. I do not lie on customs forms. Don't ask. It is a $10,000 fine per infraction, and or 5 years in jail. I of course do custom orders. I love nothing else but to make a piece yours own. I guarantee all my work. I make everything to the best of my ability and try to test it as much as I can. Quality finishing is VERY important to me. So if you are ever not happy, or something has gone amiss please let me know so we can see what can be done.